If you want to be elite, you have to beat the teams you're not supposed to beat. You have to win the games on the road against better opponents in hostile environments. The 2012 season saw plenty of those, and Michigan lost every one of them. To prove the widely-held claim after the 2011 season that Michigan was "back", they needed to do the things great Michigan teams have done in the past. You have to at least compete with Alabama. You have to beat Notre Dame and ruin their season like we always do. You have to win your division and make it to the Big Ten championship. And most of all, you have to beat Ohio State. The 2012 season was rough. It was a daunting schedule. It was a harsh look in the mirror for a program that thought it had suddenly emerged from the shadow of Rich Rod. The successes of 2011 washed away a lot of the frustrations of the 3 years prior. But it did not result in a championship...a prerequisite for any kind of successful season according to Brady Hoke. Make no mistake, wins against Notre Dame, Michigan State and Ohio State are awesome. But they don't mean anything unless you win in Indy on the first Saturday in December. In the two years the B1G Championship game has been in place, Michigan hasn't been there. For a program that prides itself on it's 42 Big Ten championships...hanging on that number 42 since 2004 has created quite a bit of angst in Ann Arbor. There's plenty of blame to go around for the fall from grace since those days of regularly competing for the conference crown. You can blame Lloyd Carr's complacency and his cleaning of the cabinets when Rodriguez was hired. You can blame Bill Martin for bumbling his way through the coaching search, and then hiring a guy to completely change everything that got you to those 42 championships. You can certainly blame Rich Rod for a bevy of things which we won't get into here. I think it's a combination of all of those things, and more, that lead Michigan to where we are now. Well, we're certainly not "back". But we're getting there. Michigan is in the midst of a recruiting bonanza the likes of which have never been seen before. 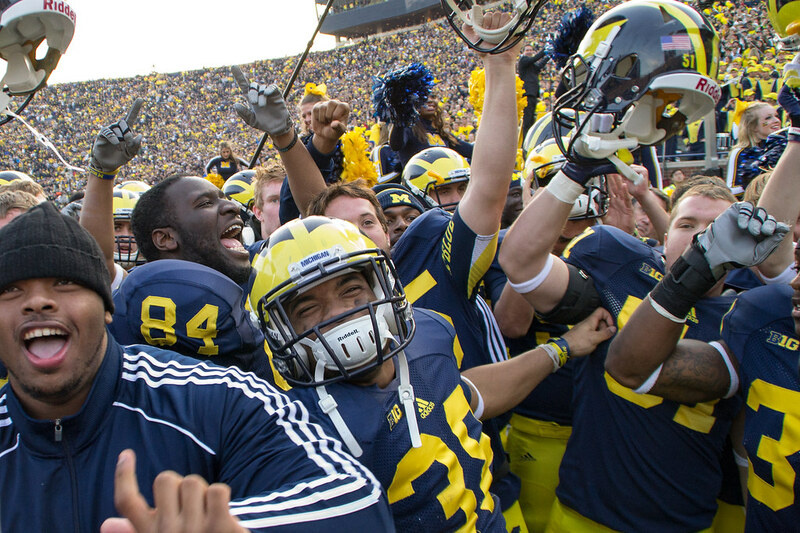 In the last 2 days alone, Michigan has added two 5-star prospects to the 2015 class. Brady Hoke is rebuilding the Michigan football program from the ground up with a blueprint that looks very familiar, but doing it in a way which we've never seen. Top rated talent from within the state of Michigan and all around the country are flocking to Ann Arbor. With great talent and great coaches come great expectations. Team 134 has one simple goal. Win the Big Ten championship. That's not only the goal, but the expectation. Sure, a few other Big Ten schools have that expectation as well. They're already clearing out a spot in the trophy case in Columbus for the B1G trophy...not that they're too confident or anything. But the path to Indy and beyond is marked with huge challenges. Road trips to East Lansing, State College and Evanston will not be easy. Thankfully, unlike last season, marquee opponents are on the home schedule this time around. But almost any championship scenario plays out with Michigan and Ohio State playing each other two weeks in a row. Please allow me to go into cardiac arrest now. Aside from the fact that I'll likely have to be sedated if and when that event occurs, it's obvious that if Michigan wants to be a championship caliber team, the Buckeyes will be happy to stand in the way to prevent that from happening. The dream scenario is to knock them off both times and call it a day while we float on our chariot to Pasadena for the Rose Bowl or perhaps a week later for another, slightly more important game. Yes, the Kool-Aid tastes great, thanks for asking. But the realistic scenario is that both games will be knock-down drag-outs...which will probably lead to a split. If you're going to lose one, lose the first. But make sure you can lose and still make it to Indy for the rematch. That way, Michigan can play ultimate spoiler and not only steal away Ohio State's BCS title hopes, but the B1G title and Rose Bowl as well. Look, I know this all seems premature. But the title of this post is "Great Expectations"...not "Mediocre Plans". With so much success on the recruiting trail and the stage being set for great things to come, it's going to have to happen sooner or later when Michigan fans are going to have to succumb to the notion that an 8-5 record or even 11 wins with no championship doesn't mean Michigan is "back". Back is when room is being made in the trophy case inside Schembechler Hall. Back is when Michigan is the odds on favorite to win the conference. Back is when we can say Michigan has 43 Big Ten titles, and working on #44. So far, it's all coming together for Hoke and Michigan. But there's a lot more work to do. And it all starts in 32 days.